Phinney’s debut is sprinkled with turns of phrase that experienced writers would envy, adeptly assigning personalities to his canine friends. 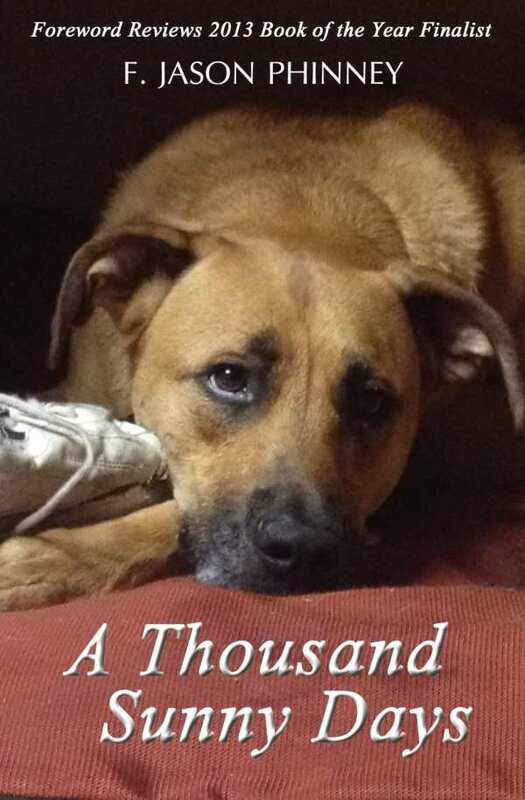 Proponents of rescuing shelter dogs have a new voice in F. Jason Phinney, whose debut memoir, A Thousand Sunny Days, illustrates how unconditional love from a pack of misfit canines enhances his life and helped him cope with a failed marriage. “Ironically, the carelessly discarded animals, unaccustomed to human kindness and affection, provided the love I desperately needed to heal my broken life,” Phinney writes in the prologue. While that sentence hints that Phinney is about to lead us through an extended Chicken Soup for the Pet Lover’s Soul passage, that deduction is quickly disproven. The book primarily focuses on how members of the rotating cast of four-legged characters enter and exit Phinney’s life over a twenty-year period, stories that—like his own life—are as heartbreaking as they are full of wagging tails and puppy breath. The chronicling of each dog’s evolving personality, and descriptions of how every new member impacts the actions of the pack, will be of particular interest to dog lovers. For an engineer-turned-first-time-author, Phinney’s writing is clean and sprinkled with turns of phrase that experienced writers would envy. He’s particularly adept at setting outdoor scenes and assigning personalities to his canine friends while only occasionally failing to resist the temptation of personification. His inexperience is exposed with excessive dialogue—back-and-forth conversations that contribute little to the plot or characters span multiple pages—and disproportionate amounts of detail attached to trivial occurrences. For example, shortly after a painstaking description of his sister’s Louisiana ranch, it takes just one sentence for Phinney to transition from engaged to calling off a wedding. Phinney’s complex relationships with his brother and father are explained just enough to pique interest, but aren’t fleshed out as thoroughly as the relationships with (and between) Bonnie, Clyde, Kodi, Kelli, and the other dogs that enter his life in various ways. All the pieces of an excellent, wide-appeal novel about love and love lost are here. As is, A Thousand Sunny Days is a dog story. Plain and simple. And for dog lovers, it delivers quite nicely.